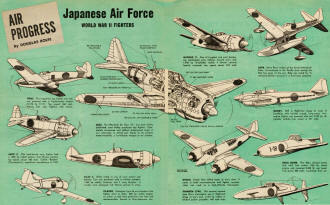 The December 1954 edition of Air Trails magazine, a mere decade past the end of World War II, did a short feature on 11 of the Japanese Air Force's most important airplanes. Description and role for each model is brief. Line drawings are provided. You might want to add a little color with a graphics editor and print out the image to use as a poster. 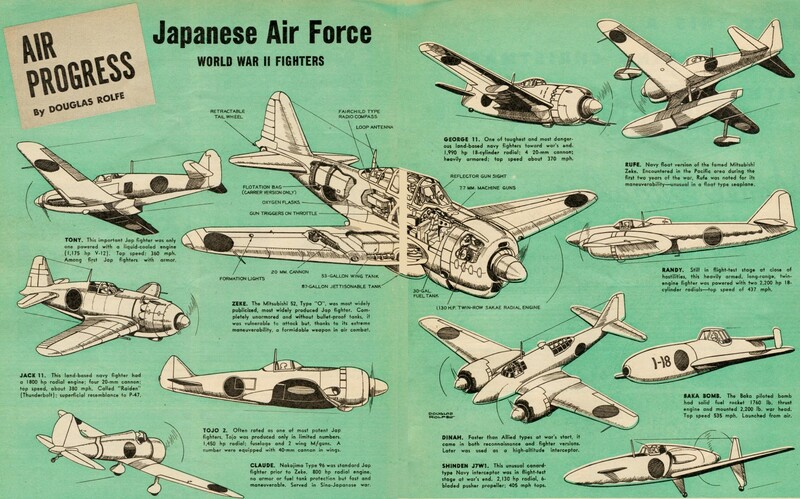 As remarked in the previous installment, the highly secretive and generally imitative qualities of prewar Japanese military aviation made it difficult to gauge its strength. It was generally thought, up to Pearl Harbor, that the quality of the Jap equipment and personnel was far below Western standards. Yet, our own aircraft were completely out­classed during the first year or so of the struggle. 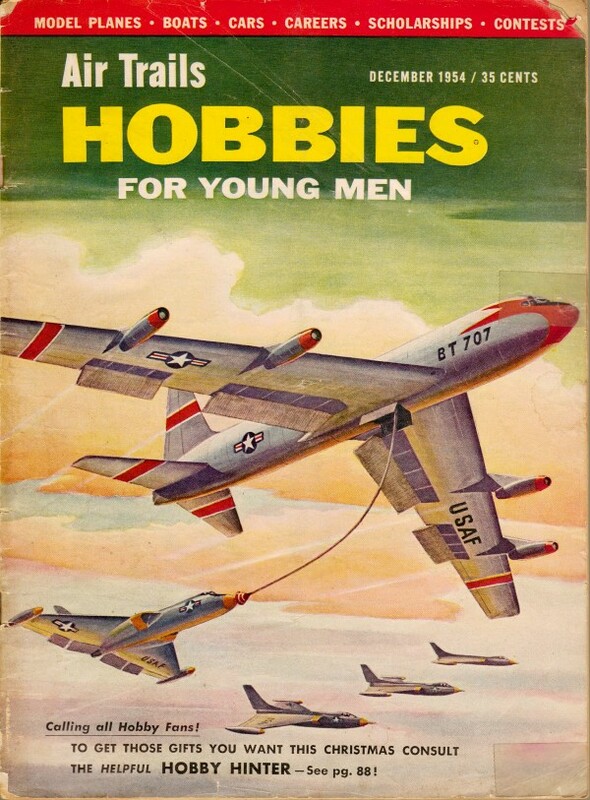 With this in mind the planes illustrated on these pages are limited. to the more troublesome Jap fighters which outflew our best during the early days, and to some models which were in the development stage at the close of hostilities. These latter show a real talent for imaginative thinking and advanced design developed by the Japanese aircraft industry since the days when they merely copied Occidental designs. It can be noted, however, that nearly all these aircraft still betray strong Western influence - notably that of U.S. and German design. The fact remains that the lightly loaded, poorly armed and armored Jap fighters taught us some sharp lessons under combat conditions and their pilots proved much better than had been dreamed of. TONY. This important Jap fighter was only one powered with a liquid-cooled engine (1,175 hp V-12). Top speed: 360 mph. Among first Jap fighters with armor. ZEKE. The Mitsubishi 52, Type "O", was most widely publicized, most widely produced Jap fighter. Completely unarmored and without bullet-proof tanks, it was vulnerable to attack but, thanks to its extreme maneuverability, a formidable weapon in air combat. JACK 11. This land-based navy fighter had a 1800 hp radial engine; four 20-mm cannon; top speed, about 380 mph. Called "Raiden" (Thunderbolt); superficial resemblance to P-47. TOJO 2. Often rated as one of most potent Jap fighters, Tojo was produced only in limited numbers. 1,450 hp radial; fuselage and 2 wing M/guns. A number were equipped with 40-mm cannon in wings. CLAUDE. Nakajima Type 96 was standard Jap fighter prior to Zeke. 800 hp radial engine, no armor or fuel tank protection but fast and maneuverable. Served in Sino-Japonese war. GEORGE 11. One of toughest and most dangerous land-based navy fighters toward war's end. 1,990 hp 18-cylinder radial; 4 20-mm cannon; heavily armored; top speed about 370 mph. RUFE. Navy float version of the famed Mitsubishi ZEKE. Encountered in the Pacific area during the first two years of the war, Rufe was noted for its maneuverability - unusual in a float type seaplane. RANDY. Still in flight-test stage at close of hostilities, this heavily armed, long-range, twin-engine fighter was powered with two 2,200 hp 18-cylinder radials - top speed of 437 mph. BAKA BOMB. The Baka piloted bomb had solid fuel rocket 1760 lb. thrust engine and mounted 2,200 lb. war head. Top speed 535 mph. Launched from air. DINAH. Faster than Allied types at war's, start, it came in both reconnaissance and fighter versions. Later was used as a high-altitude interceptor. SHINDEN J7W1. This unusual canard-type Navy interceptor was in flight-test stage at war's end. 2,130 hp radial, 6-bladed pusher propeller; 405 mph tops.